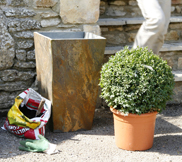 Our smart and stylish garden pots and plant pots are ideal as ‘statement’ planters at an entrance, or for adding a contemporary touch to your outdoor space. Garden pot ranges include containers in real stone and in a variety of lightweight materials, with a great choice of shapes and sizes from very large tree planters to small planters suitable for a compact town garden. Allow around a week for UK delivery. Our garden pot selection has been specially chosen for those who are looking to enhance the appearance of their outdoor living space with a touch of style for all to admire. With garden pots and planters ranging from 20cm, to a height of 80cm and a 72-litre volume, there are plenty of options to suit your garden style. Our chosen range is designed to be functional and aesthetically pleasing. Catering for both contemporary as well as traditional style preferences, from conical to square and tapered pots and from white to graphite and natural colour choices, with a range of finishes from smooth to textured, our garden pots are available individually or as a set, each with a feeling of understated elegance that will add a touch of sophistication wherever it is placed. The emphasis is very firmly on a quality appearance and an attractive natural look, meaning that the planters will blend seamlessly into your outdoor space whilst still making a statement. Our garden pots are ideal for a range of plants, shrubs and flowers. The planters come in differing weights, meaning that they have the ability to cater for whole host of planting choices. Perfect for all year use due to their frost-resistant properties and without any compromise on their look, the emphasis of all our pots is on longevity, meaning they will remain a stylish outdoor access for many years to come.